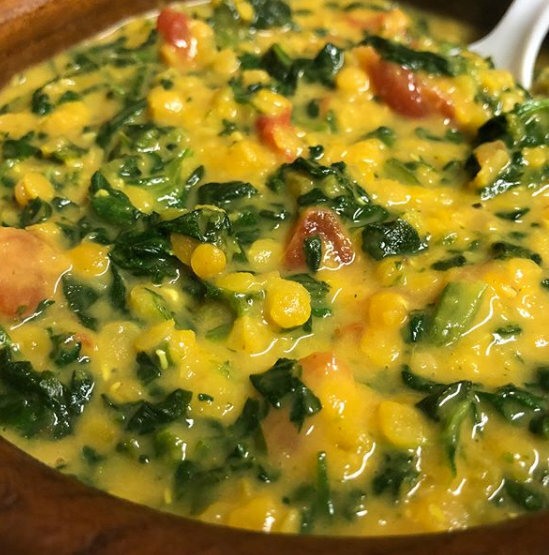 My Blissful Journey: Vegan Finds, Changes, & Updates! Vegan Finds, Changes, & Updates! I was going back thru a slew of photos I have been sitting on since my hiatus and realized just how many I still have yet to post - to blog about - and to share! This post will be just as busy as yesterday's if not BUSIER! First I wanted to share with you a salsa I made. I was lazy the other day and opened a cheap storebought salsa. It was pretty underwhelming. 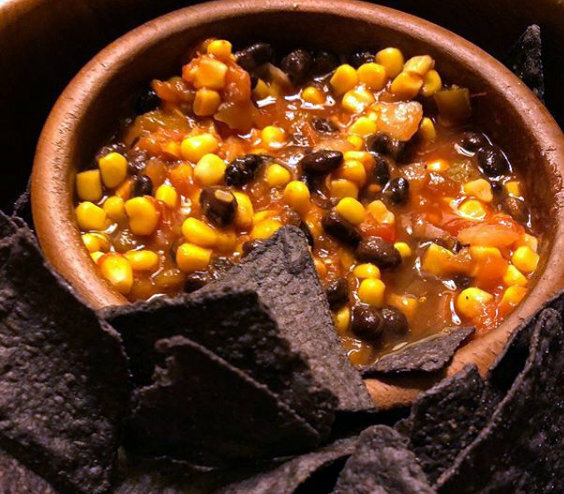 Once I added sweet corn and black beans it made all the difference in the world! Before fair week I went to Wegman's for one last shopping session before all the fair craziness! My mother and I went and had their salad bar. This is what I was able to find and it was tasty! 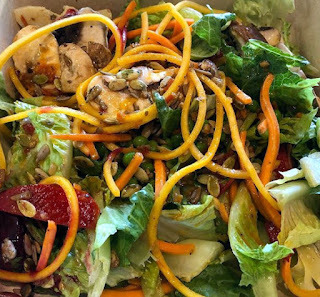 There were 2 kinds of greens for salad base, pickled sweet peppers, butternut squash zoodles, carrots, mushrooms, various seeds, cabbage, peas, artichokes, etc. I believe I topped it with a Pomegranate Balsamic of sorts. 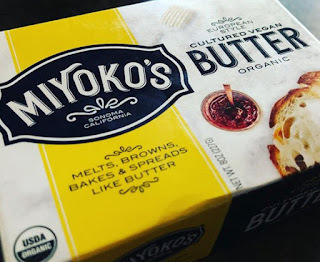 One of the items I finally broke down and purchased was Miyoko's Vegan Butter. I had not yet tried this because it's usually quite pricey. I remember it being on sale by a buck or two so I figured WHY NOT. I grabbed a package of these to have in the camper freezer. 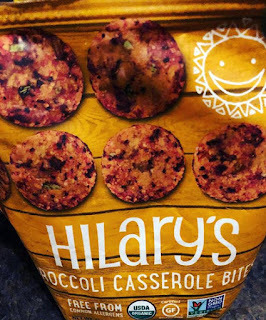 I have had them before and with the right dipping sauce, they are pretty good. 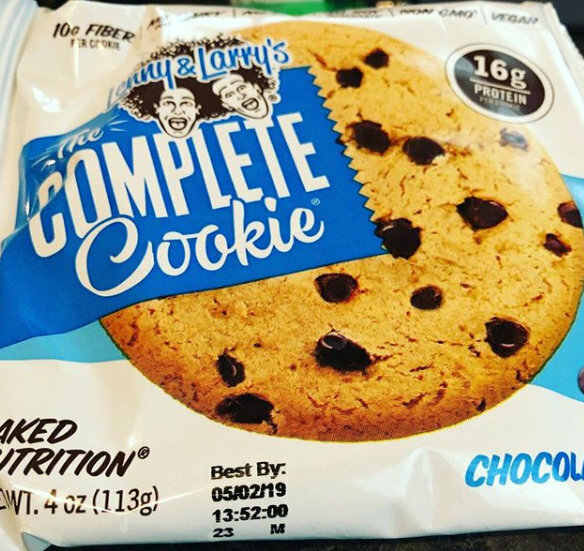 In my travels over the last couple of months I have been seeing more and more places carrying Lenny & Larry's! I remember having them when they first hit the food shows last year and enjoyed the ones I tried up to that point. I was just so excited that I saw these at our local Sheetz that I had to grab one! I picked up these but I cannot remember where I got them. I want to say they were over at the new Giant Eagle in Erie but I could be wrong. They were pretty tasty. I would probably purchase them again if I came across them. These Vegan Potato and Onion Pierogies were something left from last last Ohio Trip. They were YUMMY and I remember making a Cashew Based Alfredo Sauce which was even better than the Pierogies themselves! 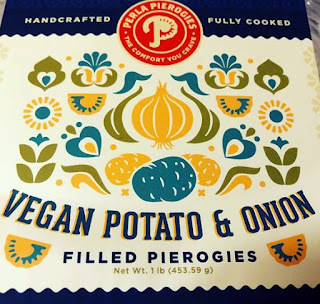 I was just sooooo thrilled to find a storebought Vegan Pierogies that I couldn't pass them up! About a month ago or more I made my first online BRANDLESS purchase. There were a few things that didn't go as planned with my order but it all worked out in the end. This was one of the things I bought and I am so happy I did! It's delicious! And I'm not going to lie...I recently had a couple of spoonsful stand alone and straight up. I know that's weird but it was tasty and I bet would make a good soup! One thing I made before Fair Week kicked in was this Lentil Curry. I just used what I had on hand (which wasn't much) but I made do with what I did have. Lentils from a Halal Market in Buffalo, Frozen Spinach, Canned Coconut Milk, Canned Stewed Tomatoes, and some spices. It turned out fine and dandy! 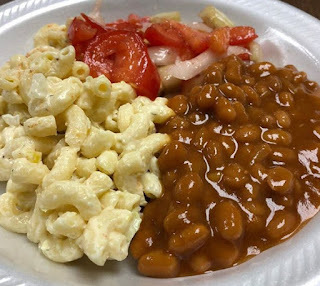 Next up is this Vegan Camping Food Plate. I have to apologize for the foam plate. I don't usually buy them or use them. It was someone elses and it was a thrown together potluck meal. My mother made Baked Beans which were vegan and no one even knew. I made the Sweet and Sugary Tomato Salad and there wasn't much of that left. I used an organic and vegan natural sugar for it. I also made the Vegan Macaroni Salad which is now being requested by many on the fairgrounds. Of course that makes me smile. 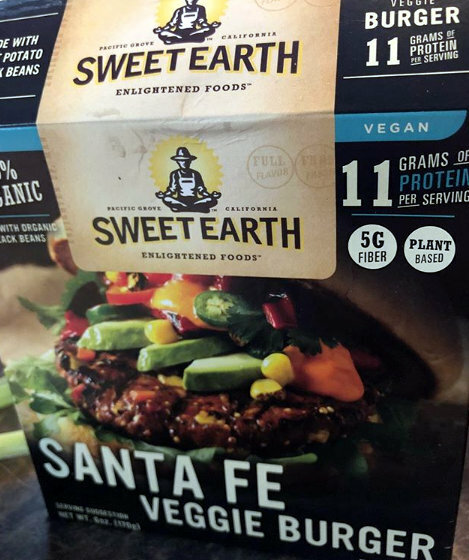 I'm glad I'm not the only one eating the vegan stuff...eventho...the other people aren't vegan. One of the new things over at the VIP Tent during fair week was the 'throw back' looking popcorn machine. The accidently vegan kicker was the 'buttery' look...it was actually a non-dairy coconut oil base. YAY! Our fair was the first full week of August but this past weekend we went to a neighboring fair. We were treated to a special 'ice cream' and because it wasn't vegan I wanted to participate somehow. 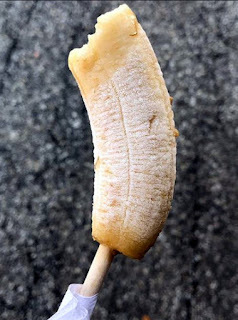 I noticed they had frozen bananas on a stick. I asked if they could do one PLAIN and she said yes. Oddly...I HATE BANANAS!!!! But I thought I would step out of my lil box of comfort and try it. When it was completely frozen it wasn't too bad. When it started to thaw I couldn't handle the banana taste or aroma. 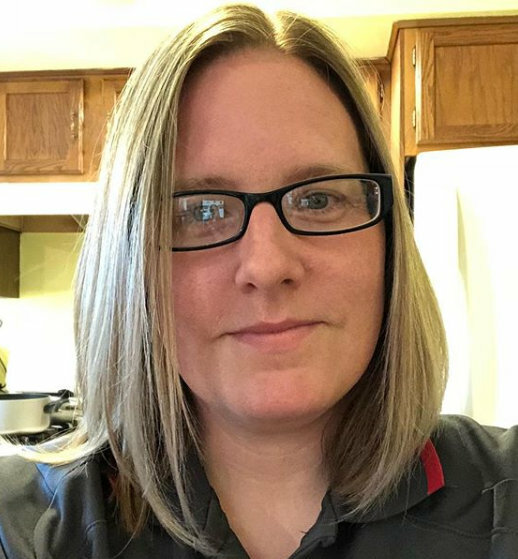 I ate what I could and shocked my husband in the process! 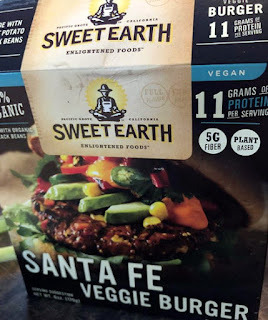 I did find another accidently vegan option this past weekend, too! This was a Blooming Potato! I asked the vendor about the oil and the fryers all they used in the fryer was potatoes and the oil base was vegetable. There were tons of toppings you could opt for but I stuck with the basic potato and hit up the condiment bar. I put onion, relish, and ketchup on them and they were VERY filling! It was a WHOLE POTATO afterall! I shared with about 6 other people, too! It was a real winner! Not sure if I mentioned on the blog but I mentioned on my IG that our town recently got a new Ollie's Bargain Outlet! I used to visit the one in Erie when I was around and always had to hit up their book section for vegan cookbooks! Now I don't have to go to Erie! I have one right here! 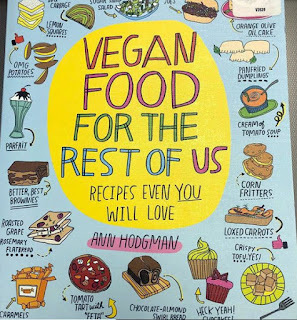 So far I have bought at least 4 or 5 discount vegan books there and added them to my collection. This was one of them. It was only $2.99. 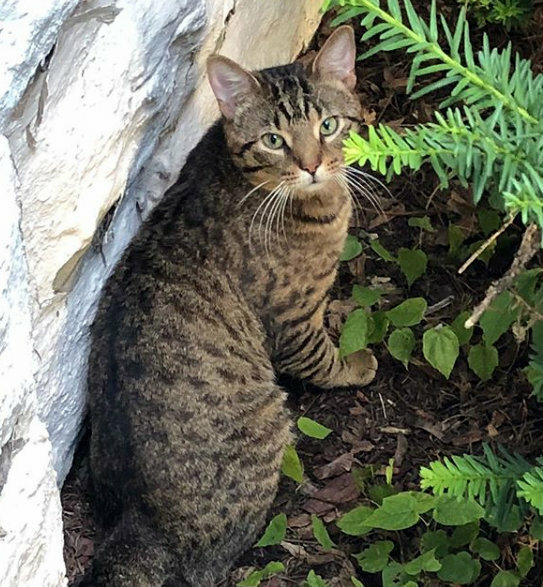 I absolutely LOVE this photo I was able to take of one of the stray cats in our neighborhood. I felt bad for her that she was stray but she seems to be fine with being outside. Prior to leaving for fair she was laying and sleeping on our front steps and stoops. As soon as I approached her she would run away. I haven't seen her in about a month. I hope she's ok. I always worry about our busy street and animals getting hit. Another thing I haven't updated you all about in a while is my adorable niece who FINALLY started walking the past couple of weeks. 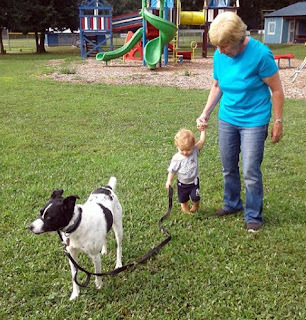 My mom and dad watch her 3 times a week and took her to a local park yesterday. Here she is with my mother and their dog Lexi. And speaking of furkids...here are my two pups! 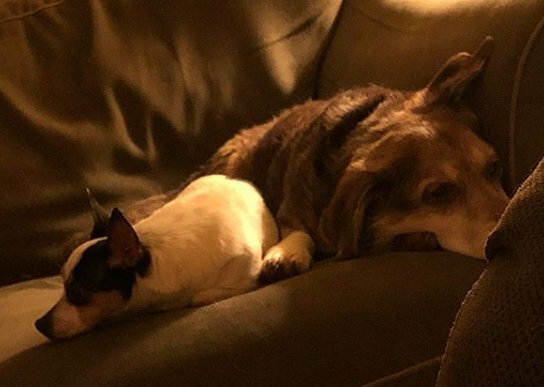 They have been doing more and more of this since we lost Paco. Riley is about 17 years old and our feral cat Charlie is 18 so I'm afraid what the future may bring with the two of them being older at the same time. Cricket is about 5 now, I think. She is still the Queen of the Castle. And another thing I forgot to tell you was that I finally cut my hair a couple of months ago and think I'm already due for another haircut! With my last two haircuts they cut off about 14 inches of hair! WOWZA! Butternut squash zoodles? My girl loves pumpkin - I am sure she would love to try those. She's gluten-intolerant and is staying off wheat flour so no wheat noodles for her, the rice ones are fine and she can go for the gluten-free pasta but those are very expensive here. So many interesting things in this post, none available here, of course. Nice cookbook you got there. I love bananas! Bananas and papayas are my favourites! LOL!!! Papaya is expensive here! I don't often buy fresh and when I do it's not very good quality. BUMMER! What did you think of the Myokos butter? Like you I am sometimes tempted to try their stuff but when I find other things for so much less it seems like I should stick to what I know. The butter is pretty good. Pretty creamy! Not as oily as Earth Balance. It is quite different in flavor than Earth Balance, too! If it's on sale I will be buying it again. It was great on a potato. I want to try and vegan butter garlic sauce for pasta with it soon! I love Brandless so much! 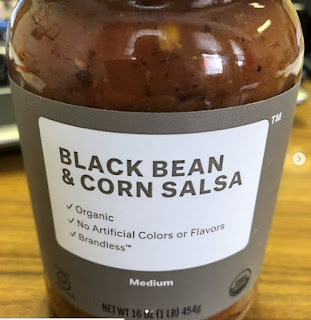 I wondered about that salsa. I'll have to try it next time I order from them. Look at your sweet little niece walking the dog!! Trinity is so funny! Quite the character, indeed! 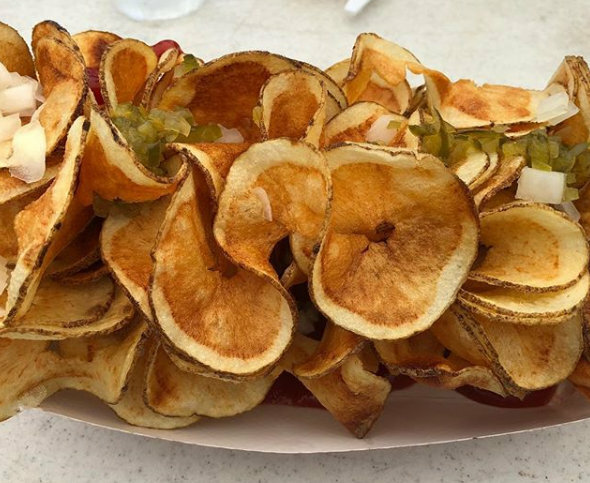 Wow, what delicious eats! I'm curious about the Miyokos butter but I'm just not a fan of any of the cheeses I've tried it's hard for me to convince myself to spend the money. I love snack type things and all of your snacks look so great! Love the haircut and sweet Cricket! Yes the price is what gets ya! Me, too! It was a nice treat, tho! I wish I could find some vegan pierogi in stores around here! 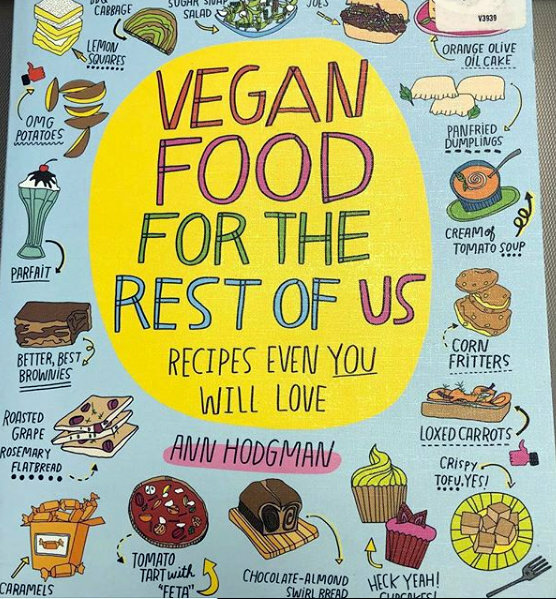 Also the plate of vegan camp food looks great, and the blooming potato sounds really fun! 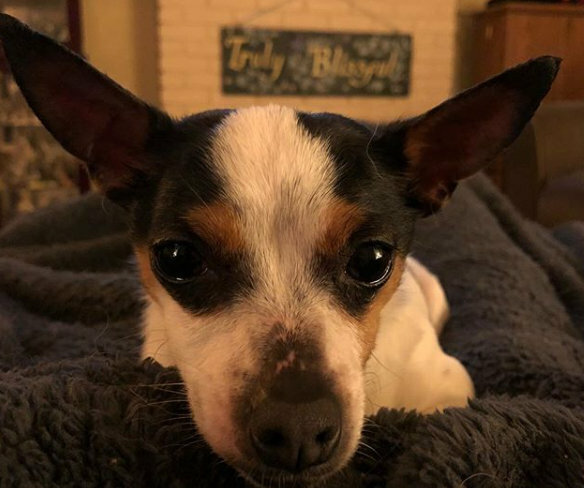 Awww Cricket -- what an adorable little face! They are the only ones I have seen and haven't seen them since. It was a 3 hour drive to the store that has these! Oye! A lot of great food! I have been seeing those Lenny & Larry cookies around lots of places here as well, it is good to see! It IS good to see! 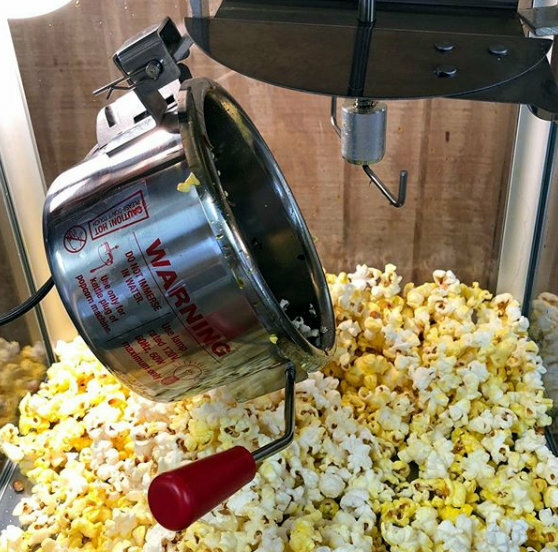 Can't wait to see what other new products start popping up! Great eats! I found those cookies locally here recently - delicious and perfect for travel. Love the hair, frames your face nicely! I agree with them being good for travel!! Thanks for the feedback on my hair, too! I've noticed more and more perogies advertise taht they are vegan. When I was in the Poconos there was a local brand that made mostly vegan perogies. There were a few cheesey ones, but they even had a vegan BLUEBERRY perogi. I wanted to try a whole bunch but they were more than what I was willing to spend.